Parapharmaceuticals products cover a heterogeneous offer: health (food supplements, muscle pain treatments), beauty (cleansers, make-up remover, floral waters), hygiene (dental care, intimate hygiene). The packaging needs of laboratories are plural while covering both the dosing / filling action as well as the screwing / capping and labelling action. CDA, a packaging machines’ manufacturer, has developed a wide range of machines to meet all these needs. CDA, a major player in packaging in Europe, has been supporting many customers for 3 decades in the purchase of a filling / screwing / labelling machine. The packaging projects that we carry out in the parapharmaceutical sector are numerous, allowing us to acquire a high level of expertise. CDA provides a filling solution for most of the parapharmaceutical products (food supplements, micellar waters, mouthwash, lubricants, balms…). CDA has also designed screwing machines to fit most caps (twist-off, cap…). Finally, we have developed a range of labelling machines able to apply labels (standard, bottle sealing label, multi layer label) on various shapes (cylindrical, conical, oval…) depending on a first label, a notch, etc.. To meet the expectations of start-ups and laboratories, we offer semi-automatic and automatic solutions for each range of machines. Whether you are a large pharmaceutical company or a start-up, a semi-automatic labeller can perfectly meet your product packaging needs. Convenient, simple, robust, these machines offer precise and professional labelling. We recommend the acquisition of a semi-automatic labelling machine for packaging small productions (premium products, launch of a new range, product testing…). CDA has designed a range of semi-automatic filling machines to meet the dosing requirements of small productions. This range of filling machines is suitable for liquid, viscous and pasty products as well as many container shapes/sizes. In order to fill your micellar waters, cleaners, balms and creams, CDA has designed several automatic filling machines. These packaging tools are known for their reliability, robustness and versatility, thus perfectly meeting the expectations of the stakeholders formulating parapharmaceutical products. Ultra compact, our monoblocks are versatile: filling, screwing, labelling are carried out on a single machine. Space saving and efficient, our monoblocks are specialized in packaging liquid to pasty products in cylindrical vials (from 5ml to 1L). Laboratories designing parapharmaceutical products are subject to significant constraints that must be taken into account when purchasing their packaging machine. From the labelling of food supplements to the dosage of a skin care balm, detecting the most suitable tool for its production becomes a major challenge. 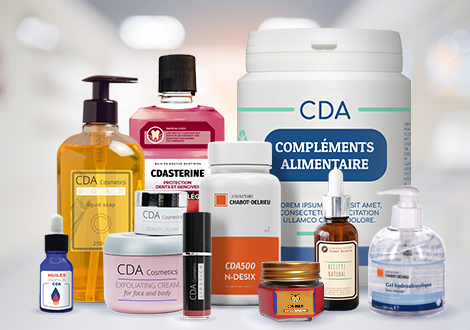 CDA, founded in 1991, has acquired expertise specific to the parapharmaceutical products sector by supporting various laboratory projects in France and abroad (via its CDA INc branch in the USA). The various specificities of this sector have been integrated by our R&D teams, allowing us to truly support you by providing you with a solution that is in line with your expectations and developments. From the scoping of your project to the start-up of your machine, including training, our satisfaction is in the realization of your projects. CDA promotes the in-house manufacture of the parts that make up its filling / screwing / labelling machines. Thanks to the control of its production and its project managers’ team, we are able to offer a high level of quality on all our machines. We respond quickly to your needs in terms of wear parts or machine optimization (addition of a labelling station, control cell, marking, etc.). Whether you are a young start-up or a recognized laboratory, CDA will be able to enhance your production by manufacturing the machine that meets all your requirements. Small productions for parapharmacy retail distribution can find a packaging solution within the range of our semi-automatic filling and labelling machines. CDA's semi-automatic labellers and fillers provide high quality standards and enhance the finished product through high dosing and labelling accuracy. Laboratories must comply with many rules regarding the packaging of parapharmaceutical products. In addition to legal constraints, laboratories must achieve a certain level of productivity to meet their commitments to their distributors. A wide range of labelling and filling machines have been developed to meet these expectations. Large laboratories can rely on our R&D team to acquire a complete and tailor-made packaging line. In addition to being a manufacturer, we are an integrator, which allows you to have only one contact person for framing, adjusting, installing and training the entire packaging line. Being supported by a single contact person is a real time and efficiency gain for the realization of your packaging chain.